My kid went off to College and her eating habits got weirder. She's always eaten a little strangely, like Caesar dressing on her hot dogs, and french dressing on mashed potatoes, but this goes beyond that! 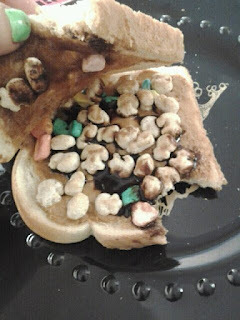 This "Dessert Sandwich"﻿ contains peanut butter, chocolate syrup, apple butter, Marshmallow Mateys, and chocolate chip cookies. Well, at least there's some cereal in there...that's healthy right...um right? !